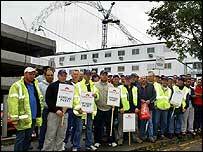 Former workers from a County Durham steel firm staged a protest during a ceremony at the new Wembley Stadium. As David Beckham and Sven Goran Eriksson attended Wednesday's "topping out" event, former Cleveland Bridge workers mounted a demonstration. The men from the Darlington company were sacked after being switched to another firm in a row between the company and main contractor Multiplex. About 100 protesters were kept back by police as dignitaries arrived. The stadium's 133-metre high steel arch - which can be seen across London - was lifted into place earlier this summer. Some 200 workers were sacked following their transfer from the County Durham firm to another company, Hollandia/Fast Track. Multiplex says Hollandia has assured bosses the stadium will be ready in time for the FA Cup final in 2006. Ian Robson, 51, from Middlesbrough, who worked as a welder on the project, said: "We want our jobs back in there to build a world class stadium. "We did that arch, with the help of Cleveland Bridge, and we have as much pride in that project as anyone else." Graham Caster, 45, also from Middlesbrough, a trade union shop steward on the project, added: "This is a peaceful demonstration. We want our jobs back with the same terms and conditions we had at Cleveland Bridge. "There are people here tonight from all over England, plus from Scotland and Wales." The 1,750-tonne arch was illuminated on Wednesday night for the occasion and stands more than four times as high as the Twin Towers of the old stadium. A spokeswoman for Cleveland Bridge said it was disappointed the firm had not been invited to the ceremony.